Lumix CPAs and Advisors - Your Financials. Enlightened. Over 85% of our business comes from referrals from current clients and other accounting professionals. We have a 100% success rate in clean financial statement audit opinions for all our clients. Our clients have never had to pay additional taxes from an IRS-initiated audit. We have a 100% rate of satisfaction from Boards we have presented to. Click on our services to find out more. There are many moving parts to the financial success of a business. We provide you with the flexibility to choose the services you need to fill the gaps that are preventing your business from operating smoothly. Depending on your needs, we can either process all your transactions or only period-end adjustments. Then, we deliver a full set of reports and analysis on a regular basis (monthly or quarterly). 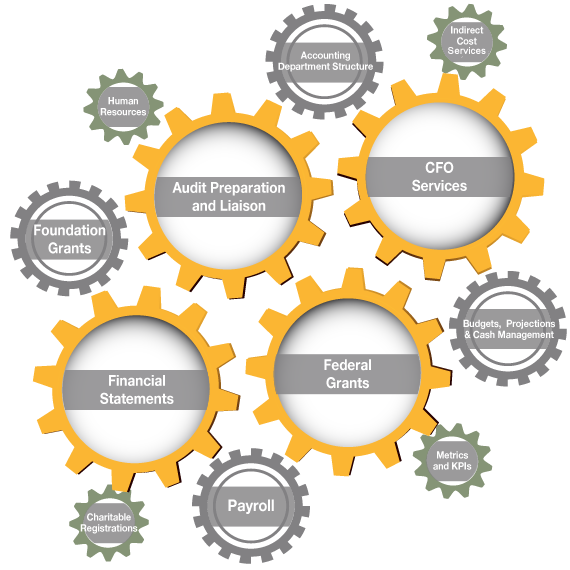 Let us prepare financial statements for your audit and provide support throughout the audit cycle. We understand the additional requirements of these grants and will help you meet them. For instance, we track reimbursements and draw funds in addition to keeping a detailed accounting of expenses. Many times, unexpected issues arise that require your immediate attention. We are available for you to leverage our expertise so you can make well-informed decisions. We offer full payroll processing including electronic payments, electronic pay stubs, and compliance with IRS and state agencies. We work with you to prepare grant proposal budgets, set up systems for accurate reporting, and prepare your financial reports to foundations. We provide you with the financial analysis you need to align your performance with your long and short-term goals. We thoroughly review the systems used to process your financial information. Then, we recommend a more efficient system with stronger controls and reliability, and train your staff on the new procedures. We organize your personnel information, prepare policies and manuals, and make sure you are compliant with federal and state laws. Recovering the correct amount of overhead on your grants can make the difference in your not-for-profit organization’s ability to thrive. What is the correct amount? We can calculate this ratio and prepare the Negotiated Indirect Cost Rate Agreement (NICRA) to submit to your cognizant agency. Soliciting funds requires proper registration with state authorities each year. Let us manage this compliance task for you. We track measurements of your strategic objective and financial health against similar entities and recognized key performance indicators (KPIs). "There is no doubt that we are a stronger organization because of our partnership."